Available in multiples of $10, $20, $50, $100 and $200 Billiards Vouchers are the easy way to solve all your present related problems. 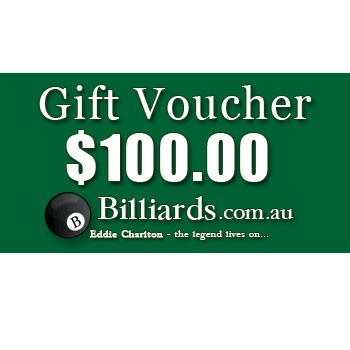 Vouchers will be emailed to the recipient and they can be used to purchase any item on www.billiards.com.au. Billiards Vouchers can be emailed almost instantly! If you order Billiards Gift Vouchers in a basket on their own, with no other products and do not add any order notes your Vouchers will be automatically sent out within an hour. This makes them an ideal last minute gift. Perfect on Sundays, Public Holidays and Christmas Day when most other orders need to be manually processed!